The world of fitness is known for its plethora of different devices, equipment, supplements and regiments. One of the major staples of fitness and exercise is dumbbells, which have been in existence for hundreds of years. These are best adjustable dumbbells that we can find. They are arguably one of the best pieces of equipment to have for fitness. The design of these weights allows for more fluid movements that mimic natural motions of the body. Recent advancements to their shape and design have allowed them to be adjustable and customizable to anyone’s needs. The history of the dumbbell can be traced all the way back to ancient Greece and Rome. They were known as “Halteres”. These Halteres were primitive hand weights that were used by the Greeks and Romans as training devices. These Halters were used in a variety of different competitions and sports such as the long jump. This variation of the long jump was a bit harder because of the extra weight of the halteres during the jump. There were three jumps included in the long jump; the first two were done with the halters and the last jump without it. Scientists have proven that these weights were used for assistance during their long jumps. The athlete we start off at a full sprint while swinging the halteres back and forth. Upon their initial jump they would swing the weight forward, helping them jump a further distance. Upon landing they would begin the process of swinging the halteres again. These Halteres were typically made from heavy metals or stone. The Halteres would weight about 20 to 70 pounds (depending on their use). Though these halters were not designed like the hand weights of today, they were held in a similar fashion. After the ancient Greek and Roman empires began to die out, other cultures developed similar weights to the halteres. “Meels” and “Nals” were used by the people of Egypt, the Middle East and also Persia. These weights were used by wrestlers as preparation for strengthening the muscles before a match. The origin of the word “dumbbell” came from Stuart period of England. During this period, this word was used to refer to the equipment was mimicking the bell rope movement. These pieces of equipment were referred to as dumb(no sound) bells(referencing the motion of pulling on a bell to ring it). Once strength trainers began to make their own equipment they decided to keep the name dumbbells. The invention of dumbbells has lead to many variations of this particular weight lifting equipment. A standard design is simply a handle with two weights attached to both ends of it. These two weights will be equally weighted and are used in strength training exercise as well as cardiovascular ones. 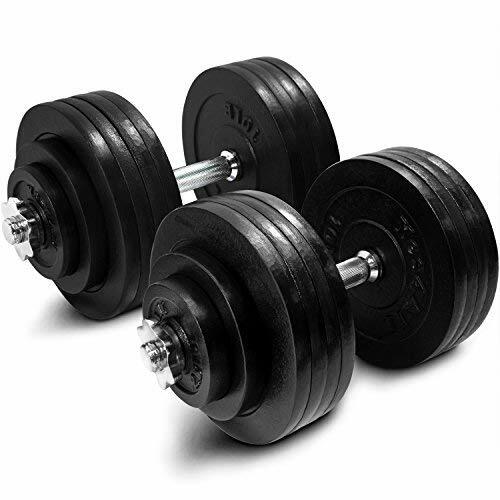 These dumbbells are also known as fixed weight dumbbells and are made from: cast iron, plastic and on some occasions rubber. Adjustable weight dumbbells and Selection dumbbells are very similar with only minor differences. An Adjustable set offers the user an opportunity to select the weight that they want to lift. This can be accomplished by removing the pin that the weight is attached to and adding or taking off the weights. With new advancements in technology, a user can simply adjust a dial and choose heavier or lighter weights. These selection weights are typically fixed to a station that acts as a storage for the weights. Selection weights are designed with a crosshatch pattern that allows a user to improve their grip. This type is made to be used with clips and collars to keep the weight stationary. These allow users to easily remove the weight plates from the hand unit and replace them with heavier or lighter ones. Many of the newer selection types are designed with easier to remove weights for quick weight selection. The major difference between selection and adjustable, is that the selection weights have no stationary port for storage. This means that a rack must be purchased to store the weights safely. Which is Best: Adjustable or Barbell? Dumbbells are typically compared to barbells in terms of which provides users a better workout and a better workout. Both of these pieces of equipment offer a wide range of benefits to users. Also both of these pieces of equipment can be used in nearly every single type of exercise possible. Adjustable dumb-bells are a typically more convenient as changing the weights is simple. Scientist have found that people are typically able to bench press more weight through the use of barbells. However, barbells can cause the muscles of the body to develop an imbalance. Dumbbells on the other hand offer you equal weight in both hands, allowing you to exercise both arms or your chest more evenly. With the popularity of flexible weights increasing, many companies have begun to produce them. There are a number of companies that you can buy inexpensive weight sets from. The benefit of buying these is you can exercise at home, which will save you time and money. Gold’s Gym offers some of the best, top quality steel plated dumb-bells. These will last you years without rusting or breaking down. Performance Fitness has created Vinyl set with changeable weights. Simply slide the pin over to select your wanted weight. These typically come with a one to two year warranty on all parts and pieces. The history of the dumbbell extends back a few centuries to ancient Greece. During this time primitive dumbbells were used for weight training as well as in certain sports events. Over time the weights would travel all across the globe, under different names. During the late Stuart period in England, they finally received the name “dumbbells”. These hand-weights also received a make over that closely resembles those in use today, which has made using them incredibly convenient. With the large amount of adaptable weights, a person can have an all in one gym in their home. The brand new Bowflex SelectTech 552 stands as a testament to the ingenuity and advancements made in sports technology. Bowflex has developed quite a reputation for itself and its products. Bowflex products are typically held in high esteem and these dumbbells represent that tradition proudly. Compared to other hand weights, these are quite inexpensive. This Bowflex flexible hand weights work incredibly well with an adjustable weight bench, to target different areas of your muscles. This set are similar to having 15 sets of weights all in one compact piece of equipment. You can easily adjust the weight from 5-52 pounds with just a turn of the handle. This is the perfect piece of home workout equipment as it takes up very little space and can be stored in a closet. There is a two-year warranty on all parts and weights. 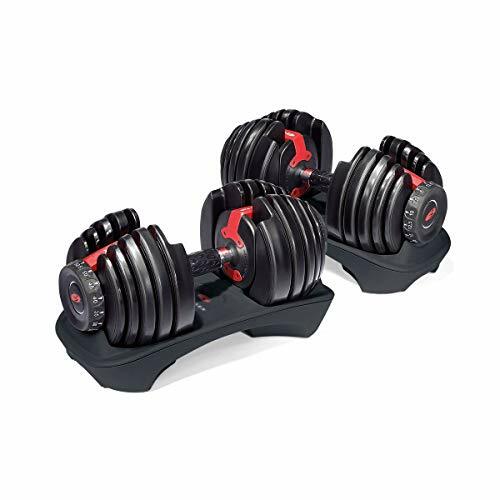 The Bowflex dumbbells can be found at almost any large retail store including: Walmart, Kmart and Target. This item is also available through ebay and amazon. Dumbbells can be adjust incredibly quickly with just a turn of the knob. Takes up very little space and can be stored under a bed or in the closet. Has a two year warranty on all parts and pieces. Takes the place to buying up to 15 different sets of weights. Easily go from 5 pounds to 52 pounds with the turn of the knob. Available at most big retail stores(walmart, kmart) and online at(amazon and ebay). Exercise DVD included which offers you a variety of different exercises to do. Dumbbells can only go up to 52 pounds. Parts can not be replaced after two years. Workout bench and weight stands are sold separately. The StairMaster is an awesome weight set for those that are just beginning to get into bodybuilding, weight training or a weight loss program. These flexi-weights offer you a six in one set that will save you tons of space. Easily stored on its weight stand, this set offers you dumbbell selections from 4-45 pounds. The adjustments comes in 5 pound increments and offer you an unbelievable price. Compared to many other changeable dumbbell sets, this set is incredible value. They are ergonomically designed to save you space and can be stored neatly in a closet or underneath your bed. The are also made from a highly damage resistant rubber with an extremely comfortable non slip grip. This amazing set comes with an workout instructional guide that will take you through various workout programs and sets. The rack itself, is set at an ideal height making it very each to get to the weights and turn the dials. The StairMaster offers you 9 sets of dumbbells in one convenient set. Adaptable dial allows for easy access to heavier or lighter weights. Dial is in increments of 5 pounds. Exercises with weights between 4-50 pounds easily. Exercise guides that offer you over 30 different exercises and routines. Awesome for those who are just beginning to learn the basic of fitness. Comes with a two year warranty on all parts. The Power Pak does not go past 50 pounds in weight. Does not come with an eating guide or nutritional instruction. Not a great option for intermediate or advanced trainers. 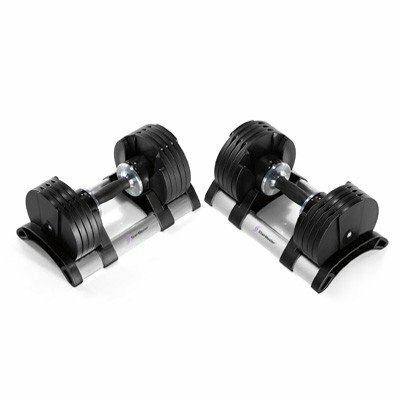 Featol Adjustable Dumbbells set is another great option for brand new trainers looking to make a change to their physiques. Featol Adjustable Dumbbells offers you an incredible option in adjustable weights set. These weight sets can be easily adjusted by a simple twist of a knob. These adjustments are made in 5 lb adjustments that go all the way. There are 8 weight settings that you can adjust it to offering you effortless adjustments in weight. These dumbbells are made from cast iron that will endure nearly any damage. The hand grips are ergonomic offering a more comfortable grip during a workout. The ergonomic design also helps it non slip, so you do not have to worry about it falling out of your hand. There is also a stand that comes with it. This stand allows for easier storage of the weights, so they won't lay on the floor. The dumbbell sets come with hand grips that are ergonomically made so they won't slip. 5 lb adjustments that go all the way up to 45 lbs. Dumbbells are made from cast iron weight plates that will not rust or wear down over time. The dumbbell sets come with a stand that is perfect for storage. The stands come with two trays that are designed to hold both dumbbells. Great for those beginners that are looking to finally get a good workout in. Dumbbells do not offer you any weights heavier than 45 lbs. The dumbbells are not designed for experienced lifters with more than two years. These dumbbells do not come with an instruction guide for different workouts. Comes with no fitness trainers DVD’s. These system does not come with a nutritional guide. The workout bench comes separately.